We had another badass, satisfying resolution to another crisis, but when it’s all over it does feel like Kabaneri bit off a bit more than it could chew. If you’re going to bring out a foe as powerful and initially terrifying as a “fused colony”, as it did last week, you’d better not hold back in using it. Last week’s cliffhanger was essentially Game Over…unless the Koutetsujou was able to seek shelter (and stop on a dime), complete with a blast door that managed to hold the colony monster back. Then the colony kinda takes a break, dicking around “gathering more Kabane”, giving everyone ample time to regroup. Too much time to maintain last week’s sense of immense peril. This is also an episode torn between two different paces: that of the immediate threat of the colony (which spends a long time not attacking), and that of Mumei’s descents into the past, when a mysterious warrior, always kept out of focus and accompanied by a glowing butterfly, saves her from sharing the fate of her family and fellow townsfolk. Mumei and Ikoma also have a nice leisurely chat about weakness and strength. Mumei doesn’t want Ikoma to save her, but he keeps trying anyway, even though the train could leave the station without him. He even gives her some blood when she starts going into withdrawal. 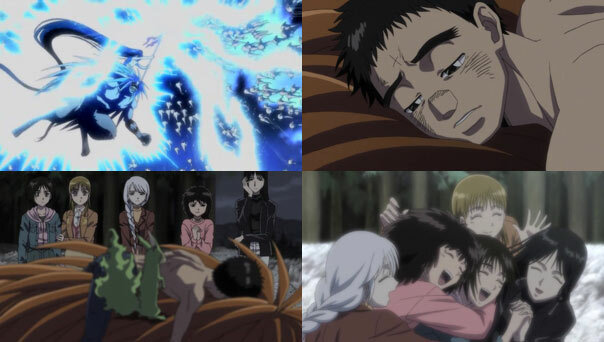 Mumei loses consciousness again when Ikoma turns to fight a horde of approaching Kabane, but when she comes to again, she’s surrounded by crewmembers there to get her out, and she finds Ikoma bitten in the stomach, but alive. Her lesson is, even though they were weak, they still survived. Being weak doesn’t mean turning over and accepting death. The experience has an immediate effect on Mumei, who was about as despondent as one could be while trapped under the rubble, but now that she’s been given a chance, in spite of having a weak moment or two (by her reckoning), she’s a lot more chipper, and decides to mend fences with the family of the dead dog, and assures the other women she’ll take care of the fused colony. The crew can say they didn’t go back just for Mumei and Ikoma, because they also picked up a huge Type 48 Cannon that they can use to dissipate the colony. But to do so the colony has to get close…too close. This is when things pick up and the episode starts redeeming itself…though I was a little skeptical that the rescue team, and the seriously-injured Ikoma and Mumei, could get back to the train as quickly as they could while the colony barely moved by comparison. Never mind, it’s time for a patented Kabaneri action sequence, with Yukina showing off her muscles when releasing the train’s pressure limits, Sukari providing a crucial assist by un-blocking the works in a very hazardous part of the train, and Takumi firing the bullet at just the right time…on his second try. The core of the colony is exposed for Mumei, who flies up and pierces it, but not before seeing…someone? Is it someone from the “team” she mentioned, of which she is the last remaining member who isn’t a Kabane? Whatever the case, the woman in the core merely screeches at Mumei, Mumei collects herself and takes her out. The resulting explosion sends Mumei flying, but Ikoma is there to catch her. When the train threatens to derail, everyone moves to one side to right it, and they escape Yashiro…though without, if I’m not mistaken, re-supplying. The episode ends without any aftermath—a bit of a disappointment—but the taste of victory may soon be replaced by train-wide hunger and increasing frustration and unrest. But maybe that’s why the episode just ended without addressing that: just enjoy the win for now; we’ll tackle the next crisis next week. 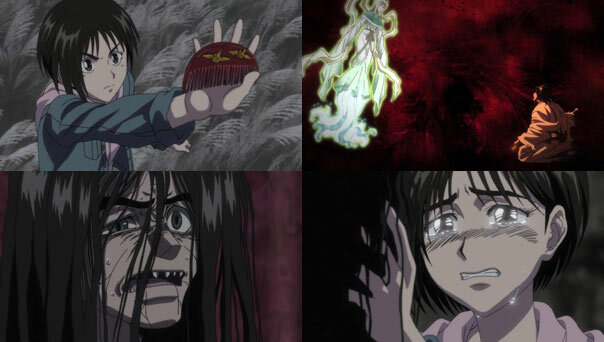 Few anime this year have worn their hearts so brazenly and so effectively on their sleeve as Ushio to Tora, and these past two episodes—in which the women (and one special woman in particular) in Ushio life literally save his soul—comprise UtT’s finest and most thrilling hour yet. Not a single line or action is wasted, and the dramatic stuff is expertly garnished with bursts of UtT’s trademark comedy. Two girls have successfully combed his hair, and once Yuu uses her athleticism and courage to be the third, that leaves his closest friends Mayuko and Asako. Mayuko almost instantly falls into a river charging ahead, but she is continually rescued by Tora, under the pretense of preserving a future meal. That neither Mayuko, a grateful Asako, nor anyone else take Tora’s malevolence seriously cracks Izuna up while showing how far he’s come whle maintaining his preferred way of showing affection to the humans around him: by claiming, almost defensively, they’re all food. With Jiemei showing him the way, Tora carries the girls to Ushio’s new location by the mouth of the cave where “a piece” of Hakumen no Mono dwells, and Mayuko reflexively uses the comb to parry a blow from the Beast Spear. That sends her flying to the edge of a cliff from which she falls rather than drop the comb that contains “all their hopes”, but fortunately for her Tora is really diligent about keeping his food clean and unharmed. Mayuko in arm, he decides he’s sick of Ushio, a human, acting like this. So he lets Ushio stab him with the spear, giving Mayuko the opening she needs. Four down, one to go. As suspected, for maximum dramatic effect, the one who loves Ushio the most is saved for last. Jeimei reveals it’s her brother who is the Beast Spear trying to devour Ushio in service of destoying Hakumen, but she begs him to stop. Ushio is even able to get the words “it hurts” out, sending the tears streaming from Asako’s eyes as she laments that all this crap is happening. Like Tora, she wants the old Ushio back, preferring him and all his lovable flaws to the mindless monster before her. As she wipes her eye she combs his hair, but the Spear senses Hakumen close and seemingly undoes all the progress the combing made, and neutralizing the power of Asako’s emotions. But she doesn’t give up, grabs hold of Ushio and doesn’t let go, and remembers all the times throughout the years Ushio pissed her off by teasing her, only to be her dopey knight in shining armor when she was in a spot. Just as Tora has a shorthand for why he helps out his “food” so much, Asako has a shorthand for the “idiot” Ushio. But she also happens to love that idiot, and all but says it when his crystal eyes shatter for good, released from the Beast Spear’s hold. Back in “normal” Beast Mode, he summons Tora and the two deal with the threat that had been bubbling around them, and had been dealt with by his dad, the chosen four, Jun, the priests, and even Hyou (Hi Hyou! ), until the end of their limits: the massive swarm of Hiyou. 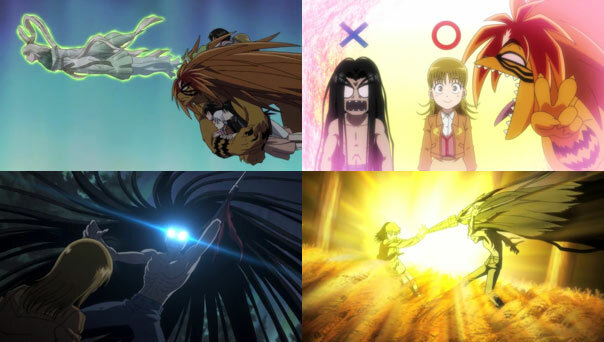 Noting he seems stronger than before, Tora works with Ushio to obliterate the storm, after which Ushio collapses from exhaustion, back to his old self. He mutters to Tora how before he woke up, he felt like he was having a strange dream full of strange people, but also filled with warm people who were at their very best. But it all seems like a dream to him; he’s unaware of what has transpired and who was involved. That Ushio may forever be ignorant to their deeds and hard-won victory is a little disappointing, but they’re right: if he learned what he did to them, he’d likely never forgive himself. They’re protecting him from needlessly punishing himself for hurting them, because to a woman, they were there by choice, and would do it again to save him in a heartbeat. This is an experience none of them will ever forget, but it’s also notable that it’s an event that brought them all together, as shown when they decide to go party together to celebrate a victory everyone who was present knows about except the one they saved. 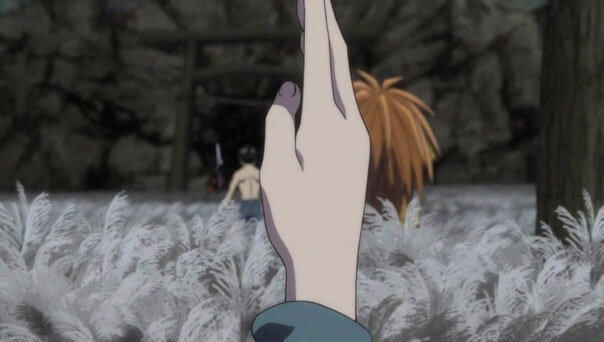 But while many friendships were forged in this ordeal, as Ushio heads into the cave with Tora (no time to waste!) all the girls not named Asako know that Ushio will definitely be back, but won’t be coming back to them, but to her. That will be some reunion.